The 13th, 14th, and 15th Amendments passed after the Civil War and transformed the women’s rights movement. 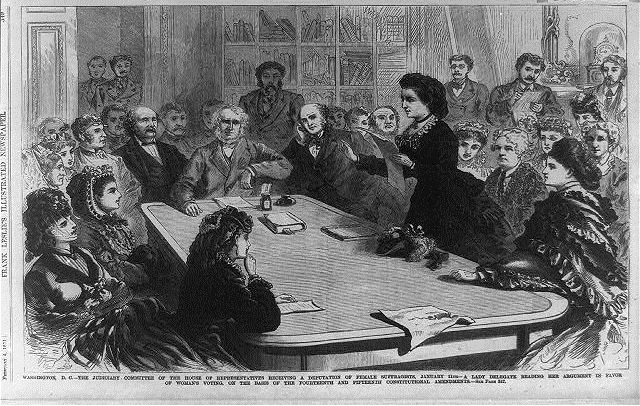 House of Representatives committee receiving a delegate reading her argument in favor of woman's voting, on the basis of the 14th and 15th Amendments, Library of Congress. Three amendments passed after the Civil War transformed the women’s rights movement. The Thirteenth Amendment, passed in 1865, made slavery illegal. Black women who were enslaved before the war became free and gained new rights to control their labor, bodies, and time. Activists bitterly fought about whether to support or oppose the Fifteenth Amendment. Stanton and Susan B. Anthony objected to the new law. They wanted women to be included with black men. Others—like Lucy Stone—supported the amendment as it was. Stone believed that women would win the vote soon. The emphasis on voting during the 1860s led women’s rights activists to focus on woman suffrage. The two sides established two rival national organizations that aimed to win women the vote. "Free!" 1863. Library of Congress: LC-USZC4-252. The 14th Amendment to the United States Constitution, ratified on July 9, 1868, granted African Americans their freedom. Shown here is a print of an African American slave reaching freedom. The print is entitled “Free!” and was created circa 1863 by Henry Louis Stephens. The 14th Amendment specifically granted men the right to vote. A.R. Waud. "The first vote." 1867. Library of Congress: LC-USZ62-19234 . On February 3, 1870 the 15th Amendment of the United States Constitution was ratified. This amendment stated “The rights of citizens of the United States to vote shall not be denied or abridged by the United States or by any state on account of race, color, or previous condition of servitude.” This ensured that all men had the right to vote no matter their race. However, it did not grant women the right to vote. The image shown here is a print from 1867 by Alfred Rudolph Waud and shows a line of American Americans, all in different dress, being allowed to cast their first ballot.